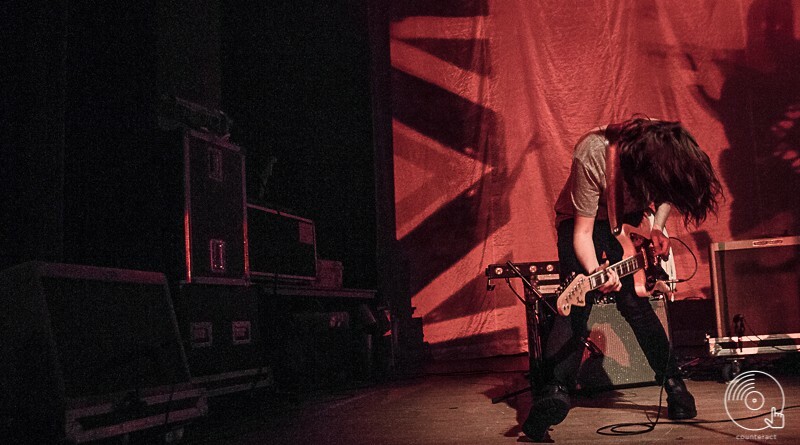 On a cold, rainy Friday night in Wolverhampton, Courtney Barnett brought her unique style of feedbacked guitar and down to earth, witty, rambling lyrics to the Wulfrun Hall, with support from fellow Melbourne musicians, Big Scary. The performance began with the support band taking to the stage around 8 pm, the venue being half full, although gradually filling up with people as the set unfolded. Big Scary, winners of the 2014 Australian Music Prize for their album, Not Art, played their mixture of bass grooved, intimate indie-pop and electronica-influenced music, with the added bonus of a saxophone to aid the performance of the single, ‘Organisms’. The band appeared relaxed on the stage, although, they seemed to lack the liveliness of a band enjoying their time in the spotlight, up until the last two songs of their set when it took a more spirited turn. The set itself was engaging and the band proved to be an originative and experimental opening act for the main artist. Following the short break between instrument changes, Courtney Barnett took to the stage, looking as casual as expected in a green t-shirt and jeans, accompanied by her drummer and bassist. Without a word or a moment wasted, slouched over her guitar, she dived straight into the garage-rock infused, panic attack ramblings of the opening song, ‘Avant Gardner’, from the double EP, A Sea of Split Peas. The first thing that stood out was that Courtney Barnett does not have what would be traditionally classed as a magnetic stage presence. Instead, it is a naturalness and informality that makes her such a great musician. The down to earth attitude, ‘this is me, this is what I do, like it or not’, exuded from her presence and her self-deprecating, story-like lyrics made her an intriguing, relatable and fantastic artist to watch. There were no breaks between the songs, each one flowed straight into the other keeping the audience’s full attention and the readiness to hear more of her dry, humorous wordplay. The opening song blended straight into the pop sounding ‘Dead Fox’, then ‘Small Poppies’, both from the critically acclaimed debut album, Sometimes I Sit and Think, and Sometimes I Just Sit. The colourful, retro-inspired, backdrop animations, produced a light-hearted atmosphere and made the performance of each song an individual work of art. Songs, such as ‘An Illustration of Loneliness’, told the tale of insomnia, over-thinking and missing a lover, whilst ‘Boxing Day Blues’, provided a sensitive and sombre look into the self-doubt that comes from feeling inadequate and lost in failing relationships. It was not until near the end of the set, the beginning of ‘Nobody Really Cares If You Don’t Go To The Party’, that the audience was addressed, although this did not matter at all. This performance was – simply put – all about the music, along with her lyrical implications of putting too much thought into insignificant details. Each song was delivered with the same level of energy and as much enthusiasm as any artist could give, along with the instruments, vocals and satisfying shabbiness, drawing an undeniable parallel to the slacker grunge ethos of the early nineties. The set ended with the phenomenal, self-aware rant of, ‘Pedestrian at Best’, the lyric ‘give me all your money/and I’ll make some origami, honey’, giving a clear indication that making music for Courtney is not about the prospect of wealth, image or selling out. A belief that should be greatly appreciated in the current world of horrendously shallow mainstream music, being released based on overproduction and the looks or image of the (so-called) artists. Courtney Barnett was very much a band at this performance, as oppose to the solo performer that was imagined. The bassist provided backing vocals when needed, the drummer did not miss a beat and altogether the three musicians took ownership of the stage to produce a first-rate performance. The encore provided an opportunity for the support band to return to the stage and show us the energy level that they did not express during their earlier set. Both bands got together to perform a cover of The Saints’ ‘Know Your Product’, an appropriate choice given that it is based on never getting what you want or need through consumerist society, which aptly mirrors Courtney’s lyrics, on the expectations and disappointments of modern day life. The final song was ‘History Eraser’, a verbal dream of surrealist romance and travel, with the band exiting the stage to a haze of feedback and colourful screen projection, making the perfect end to a night of unedited self-expressive music. Although Courtney states, ‘put me on a pedestal/I’ll only disappoint you’, based on the performance of her and her bandmates, I seriously doubt that anybody could leave one her gigs with a feeling of disappointment. She rocked!